Nascimento won the roll and elected to go first. He started with a hand of Solemn Warning, Solemn Judgment, Trickstar Lilybell, Trickstar Lycoris and Dinowrestler Pankratops. He Set Solemn Warning and Solemn Judgment, Normal Summoned Trickstar Lycoris and passed. Gonzaga drew and took 200 damage from Trickstar Lycoris. He Activated Sky Striker Mecha Modules – Multirole then Sky Striker Mobilize – Engage!, adding Sky Striker Ace – Raye from his Deck to his hand and taking another 200 damage from Trickstar Lycoris’s effect. Gonzaga activated Sky Striker Airspace – Area Zero then Normal Summoned Sky Striker Ace – Raye. he activated the Field’s Effect targeting Raye then activated Raye’s effect but Gonzaga negated the effect with Solemn Warning. Gonzaga resolved Area Zero’s effect, taking Sky Striker Mecha – Eagle Booster to his hand, taking another 200 damage from Lycoris. Next, he used Sky Striker Mecha Modules – Multirole’s effect to send Sky Striker Airspace – Area Zero to the Graveyard which was used to Special Summon Sky Striker Ace – Raye form the Deck. Sky Striker Ace – Raye was used to Link Summon Sky Striker Ace – Kagari but Nascimento shut down that Summon with Solemn Judgment! He was quickly at 3000 LP from his own cards. Gonzaga Set a card then used Multirole’s effect to Set Sky Striker Mobilize – Engage! and Sky Striker Airspace – Area Zero form his Graveyard to the field. Nascimento attacked with Trickstar Lycoris for 1600. Gonzaga took another 200 damage from Trickstar Lycoris’s effect. Gonzaga activated the Set Sky Striker Mobilize – Engage! adding Sky Striker Mecha – Hornet Drones from his Deck to his hand, banishing the Sky Striker Mobilize – Engage!. Nascimento activated Droll & Lock Bird to stop drawing a Danger! Nessie searching his turn. Gonzaga then activated Sky Striker Mecha – Hornet Drones to Special Summon a Token and he used that Token to Link Summon Sky Striker Ace – Hayate which attacked into Nascimento’s Trickstar Lycoris. Gonzaga used the effect of Sky Striker Ace – Hayate to send Sky Striker Mecha – Widow Anchor from his Deck to the Graveyard. Sky Striker Ace – Raye hopped out of the Graveyard and Nascimento activated its effect, Tributing Raye to Special Summon Shizuku from the Extra Deck. Shizuku attacked over Lycoris. Gonzaga Set a card in the Main Phase and in the End Phase Set another card form the Graveyard with Sky Striker Mecha Modules – Multirole. Nascimento Special Summoned Dinowrestler Pankratops then Normal Summoned Trickstar Lilybell. Pankratops attacked into Gonzaga’s Sky Striker Ace – Shizuku, allowing Gonzaga to Special Summon Sky Striker Ace – Raye from the Graveyard. Sky Striker Ace – Raye went back to the Graveyard to Special Summon another Shizuku. Trickstar Lilybell attacked directly but Gonzaga activated Infinite Impermanence to force a replay. Prankratops used its effect, Tributing itself to destroy Shuzuku but Gonzaga chained Sky Striker Mecha – Eagle Booster to make Sky Striker Ace – Shizuku unaffected by other card effects for the turn. In the End Phase, Sky Striker Ace – Shizuku’s effect let Gonzaga add Sky Striker Mobilize – Engage! from his Deck to his hand. Gonzaga activated the Set Sky Striker Airspace – Area Zero. He then Set a card and used the Field Spell’s effect to add another Multirole to his hand, with Gonzaga sending the Set Upstart Goblin to the Graveyard. Nascimento activated Droll & Lock Bird afterwards to stop further searching and drawing this turn. Gonzaga had Shizuku attack over Trickstar Lilybell. In the End Phase, Sky Striker Mecha Modules – Multirole’s effect let Gonzaga Set Sky Striker Mecha – Eagle Booster from the Graveyard. Nascimento drew and Set Rivalry of Warlords and passed. Gonzaga activated Sky Striker Mobilize – Engage!, adding Sky Striker Mecha – Shark Cannon from his Deck to his hand. he Set a card then used the field Spell again, taking Sky Striker Maneuver – Afterburners! and sending Terraforming to the Graveyard. Shizuku went to the Graveyard to Link Summon Sky Striker Ace – Kagari which brought back Sky Striker Mobilize – Engage!. Gonzaga activated a second Sky Striker Mecha Modules – Multirole and used the first Multirole to send the second one. Next, he activated Sky Striker Maneuver – Afterburners! destroying his own Sky Striker Ace – Kagari and Nascimento’s Set Rivalry of Warlords. Sky Striker Mobilize – Engage! 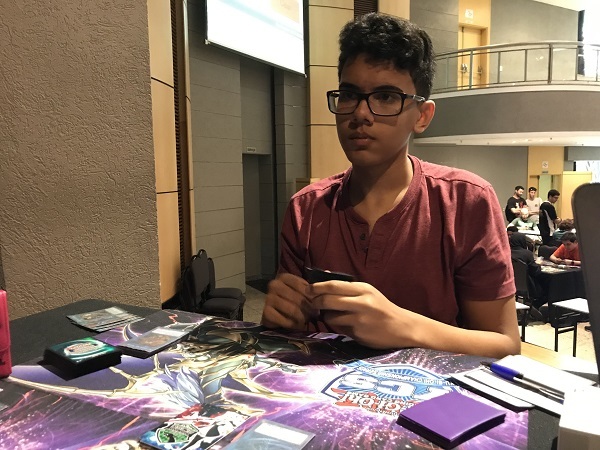 came down next to add Sky Striker Ace – Raye from his Deck to his hand, and with a clear field, Sky Striker Ace – Raye’s attack and a follow-up attack from a Sky Striker Link monster would be enough to end it. Nascimento conceded here and we’re moving to the second Duel. Nascimento elected to go first. He started with a hand of 2 copies of Trickstar Lycoris, Solemn Judgment, Scapegoat and Ash Blossom & Joyous Spring. He Normal Summoned one of the Trickstar Lycoris, Set Scapegoat and Solemn Judgment and passed. Gonzaga Set 3 cards then activated Sky Striker Airspace – Area Zero. He Set a fourth card then used the field effect, hitting Sky Striker Mobilize – Engage! which was added to his hand and the Set Metalfoes Fusion was sent to the Graveyard. Gonzaga attempted to activated Sky Striker Mobilize – Engage! but Nascimento chained Ash Blossom & Joyous Spring from his hand to negate it. Gonzaga proceeded to Normal Summon Sky Striker Ace – Raye then used her to Link Summon Sky Striker Ace – Kagari but Nascimento negate the Summon with Solemn Judgment! Next, Gonzaga used Metalfoes Fusion, putting it from the Graveyard back into the Deck to draw card. In the End Phase, Nascimento activated Scapegoat, filling his field with monsters. Nascimento drew Shared Ride. 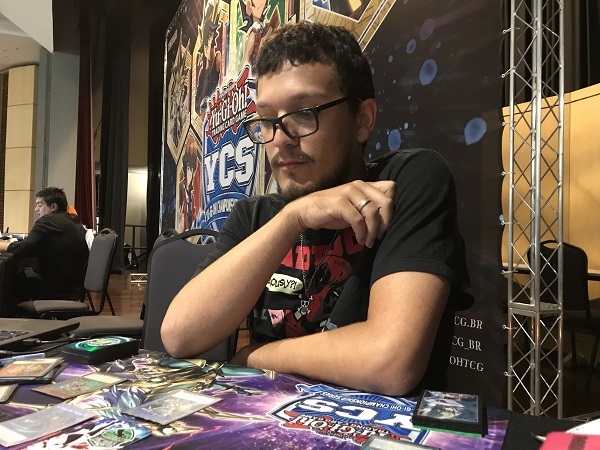 Nascimento started by using a Sheep Token to Link Summon Linkuriboh. Next, he used Trickstar Lycoris and another Token to Link Summon Knightmare Phoenix. He used the effect, discarding Trickstar Lycoris to destroy Gonzaga’s Set Sky Striker Mecha – Eagle Booster and draw Trickstar Reincarnation. Knightmare Phoenix and Linkuriboh were used to Link Summon Topologic Trisbaena. Next, another Token was used to Link Summon Link Spider. Nascimento activated Topologic Trisbaena’s effect but Gonzaga negated it with his Set Sky Striker Mecha – Widow Anchor. Link Spider and Topologic Trisbaena attacked directly. Nascimento Set Trickstar Reincarnation and Shared Ride and passed. Gonzaga used Area Zero’s effect targeting his last Set, adding Sky Striker Maneuver – Afterburners! to his hand and sending Sky Striker Mecharmory – Hercules Base to the Graveyard. After the chain resolved, Nascimento activated Trickstar Reincarnation to make Gonzaga banish his hand. Gonzaga then activated Multirole and used its effect to send Area Zero to the Graveyard, using that effect in the Graveyard to Special Summon Sky Striker Ace – Raye from the Deck. In the Battle Phase, Sky Striker Ace – Raye attacked and destroyed Nascimento’s Link Spider, then Sky Striker Ace – Raye was Tributed to Special Summon Sky Striker Ace – Kagari from the Extra Deck. Sky Striker Ace – Kagari’s effect added Sky Striker Mobilize – Engage! from the Graveyard back to his hand. Sky Striker Ace – Kagari’s effect added back Sky Striker Mobilize – Engage!. Next, Kagari tried to attack a Token but Nascimento activated Linkuriboh form the Graveyard, Tributing the Token to Special Summon it. Because Nascimento put it in a zone Topologic Trisbaena was pointing to, he activated Topologic Trisbaena’s effect, and then chained Shared Ride but Gonzaga chained Ash Blossom & Joyous Spring to negate it. In Main Phase 2, Kagari swapped out for Sky Striker Ace – Shizuku. In the End Phase, Shizuku’s effect let Gonzaga add Sky Striker Mobilize – Engage! from his Deck to his hand. In the End Phase, Trickstar Reincarnation was used from Nascimento’s Graveyard to Special Summon Trickstar Lycoris and Topologic Trisbaena’s effect banished Trickstar Lycoris and Gonzaga’s Set Sky Striker Mecha – Eagle Booster. Gonzaga elected to go first. He started with Sky Striker Ace – Raye which was used to Link Summon Sky Striker Ace – Shizuku. he Set 2 cards to the back and in the end phase, Gonzaga added Sky Striker Mobilize – Engage! with Shizulu’s effect. Nascimento drew Rivalry of Warlords. He went straight to the Battle Phase where he activated Evenly Matched, forcing Gonzaga to banish his 2 Set cards leaving Sky Striker Ace – Shizuku. Nascimento then Normal Summoned Trickstar Candina whose effect added Trickstar Reincarnation. He Set Imperial Order, Infinite Impermanence and Trickstar Reincarnation and passed with a hand of Ash Blossom & Joyous Spring and Eater of Millions. Gonzaga Set 2 cards and activated Sky Striker Mobilize – Engage! but Nascimento flipped Imperial Order face-up! Gonzaga will now have to deal with a lot of his cards being negated. Sky Striker Ace – Shizuku went to the Graveyard to Link Summon Sky Striker Ace – Hayate. Sky Striker Ace – Hayate’s direct attack connected, sending Sky Striker Mecha – Widow Anchor from the Deck to the Graveyard. In Main Phase 2, Hayate swapped out for Sky Striker Ace – Kagari whose effect added back Sky Striker Mobilize – Engage!. Sky Striker Ace – Kagari swapped for Sky Striker Ace – Shizuku and that effect added Sky Striker Mecha Modules – Multirole from Gonzaga’s Deck to his hand in the End Phase. Nascimento drew Trickstar Lycoris. He activated the effect of Trickstar Light Stage forgetting about Imperial Order’s effect! No loss there, however. He used Trickstar Lycoris’s effect to bring Trickstar Candina back to his hand then Normal Summoned Candina again to add another Trickstar Lycoris from his Deck to his hand. Next, he banished 5 monsters from his Extra Deck to Special Summon Eater of Millions. In the Battle Phase, Nascimento activated a Set Rivalry of Warlords which forced him to send his own Eater of Millions to the Graveyard but it does prevent Gonzaga from using Sky Striker Ace – Raye shenanigans. One of Nascimento’s monsters attacked and destroyed Gonzaga’s Sky Striker Ace – Shizuku, allowing Gonzaga to being Sky Striker Ace – Raye back from the Graveyard. Sky Striker Ace – Raye couldn’t tag into a new Link Monster and was destroyed in battle. The rest of Nascimento’s monsters attacked directly, leaving Gonzaga at 5100 to to Nascimento’s 3800 LP. Gonzaga drew but couldn’t do anything under Nascimento’s Imperial Order. He extended the handshake and Henrique Domingues Nascimento is moving to the Finals!